Take a stroll down Main Street with us. Make a pinwheel, a travel memory game and pretty faux stained glass. $5 per session or 3 for $12, includes supplies. Celebrate the arts this week. Make a painting with crayons and watercolor, sculpt imaginative pinch pot monsters and transform a sheet of paper with tissue paper and water. $5 per session or 3 for $12, includes supplies. Don’t miss this week’s music festival. Create a fringed bell anklet, paint a canvas with a musical theme and craft a water bottle holder. $5 per session or 3 for $12, includes supplies. Are you ready for flea market fun? Tape together a bead bracelet, a wallet or pouch and a make-believe camera with Duck Tape®. $5 per session or 3 for $12, includes supplies. Use a Michaels Tim Holtz Ideaology kits to create a project with Old World charm. Supplies not included. Inspired by music festival fashion, this DIY feather necklace is a must-make for summer. Supplies not included. Grab a friend and join us for our Maker Party on Saturday, July 25th from 1pm-4pm where you’ll craft Pinterest inspired projects perfect for Back to School. Free with the cost of supplies. Kids can make fun foam print art to show all of their friends. Ages 3 and up. Only $2 per session, includes supplies. 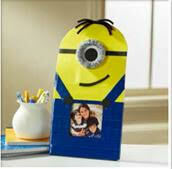 Kids can make a minion-themed frame to decorate their rooms with a classic movie favorite. Ages 3 and up. Only $2 per session, includes supplies. Stop by and create a cute button frame so your little maker can decorate his or her room with a photo of friends. Ages 3 and up. Only $2 per session, includes supplies. Drop in and create a colorful rain stick for summer. Ages 3 and up. Only $2 per session, includes supplies. For more information, check your local Michaels store!